Learn ALL About Parsons Chairs, History, SlipCovers, and More! When you think about traditional decor you may have a visual, of big formal dining rooms or luxurious sittings rooms right? 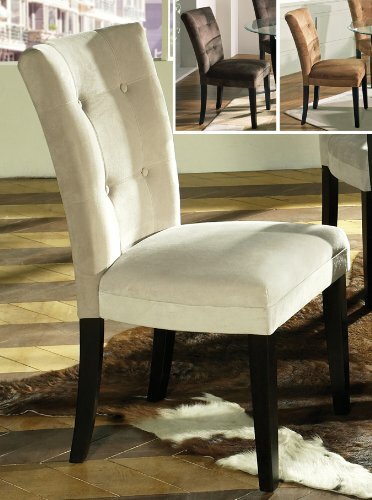 You have to admit, parsons chairs do have a positively regal appearance that reeks of class and contemporary style. The traditional models can be easily adapted to suit casual and family environments as well. Classic parsons chairs designs are truly timeless and softly elegant. This chair won't, anytime soon, go out of style. The simplicity of the design makes it easily blend into any environment. Adding a chair cover gives the parson chair a sort of ambiguity if you want to virtually hide it until you need an extra chair for guests, and ability to blend in like a chameleon but one that also adds style and depth to any room or setting. With That, let's discover the full story behind Parsons chairs, their attributes, styles, details, and how they've become modernized without losing their elegant classic look and "feel"! The Parsons chair originated in Paris around 1930. It was the creation of a designer from the famous Parsons School of Design. These chairs are known for their natural "feel", their incredible simplicity, and linear look. It's the simple and basic design that gives it it's chameleonic power and it's ability to blend in and stand out at the same time! The designers didn't radically reinvent the style. They just streamlined some consolidated historical influences. What worked they used and enhanced the piece with, what didn't they removed from the design. 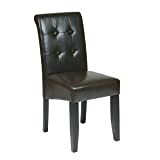 Today this chair is a synergistic classic historical transitional piece. The era of the time the chair was created was the Art Deco period which was also merged into the design. Parsons chairs main conceptual designs spawn from both classic schools of design and modern. 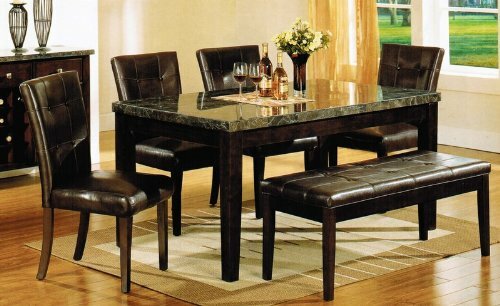 This table was like the chair, simple, elegant, and powerfully natural. 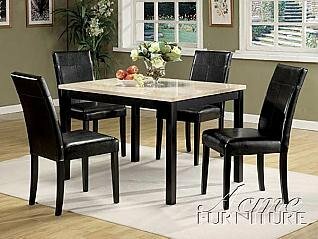 Because both the chairs and the table fit in so well with most other themes and furniture pieces the tables and chairs parted ways and continue to both work with parsons chairs and tables, or other furniture, designs, and styles. The two are rarely found together anymore but both continue to evolve and gain traction even in modern times! 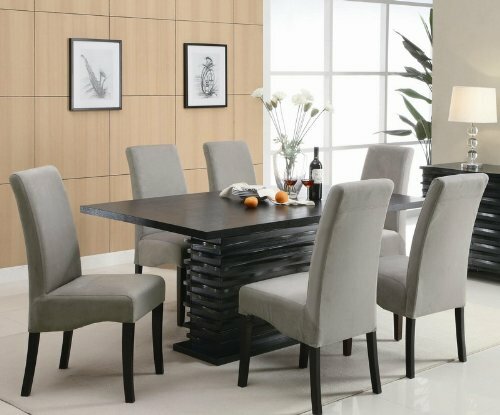 These chairs are not just dining room chairs, in fact they bring elegance to every part of the home and in this article you'll learn about many styles and some history of how they came to be. Parsons chairs are considered overall to be (in modern times) a transitional piece of furniture. This is because it's design has evolved over several periods encompassing a powerfully simple but elegant piece that remains impressive today. The periods incorporated into the chairs design include the Arts and Crafts period, The Art Nouveau, Art Deco, and Mission periods. Although the chair has a lot of options to choose from, the construction has remained relatively the same. It's a charming and sophisticated piece! For People Who Love That Change Is The Only Constance! 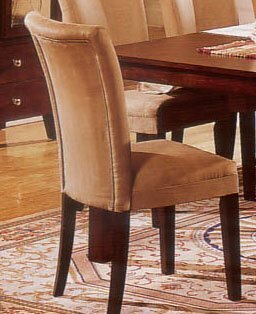 Parsons chairs are great because they have many styles to choose from and go with just about everything, but one of the greatest features of the chair is the simplicity of using slipcovers on it. It's design is so basic that slipcovers can be thrown on and will often look like it was built into the chair in the first place. 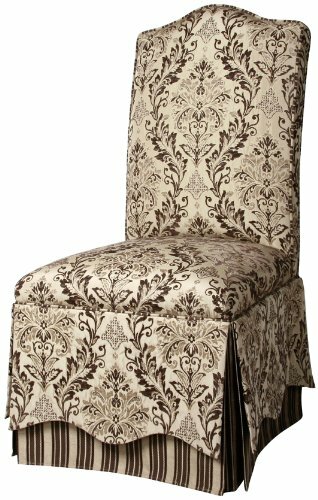 Slipcovers give the chair the ability to completely change into any color, pattern, and look to match your decor. Regardless of the original look and feel the slipcovers give you literally tens of thousands of choices (or many more!). 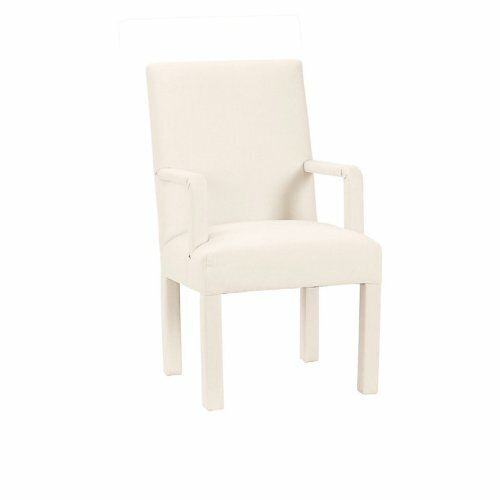 Slipcovers are manufactured all over the place and can drastically change the chairs appeal in different environments. 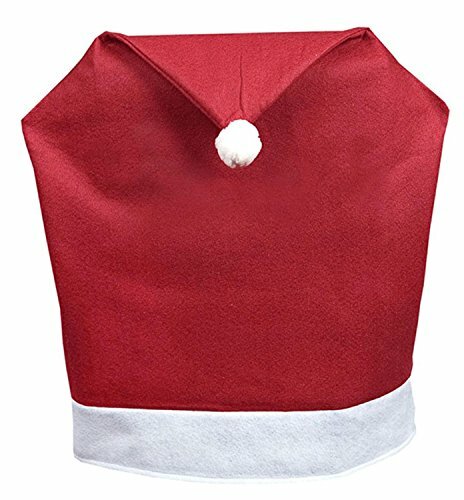 You can get slipcovers for holidays or special occasions and many companies even custom make them with your family crest or any design you choose. 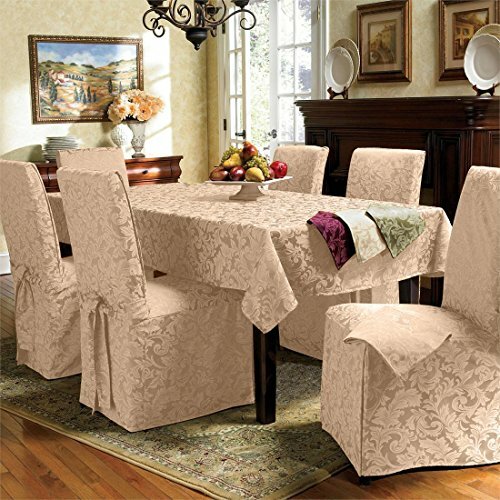 Example Of Using Slipcovers For Special Occasions To Match The Tablecloth! Slipcovers can be designed to cover the entire chair or just to create a skirt or ruffle at the bottom. You can put slipcovers on that accent just the top area (not the legs) or you can get some that make the chair appear more opaque and solid. You can even get the legs upholstered! 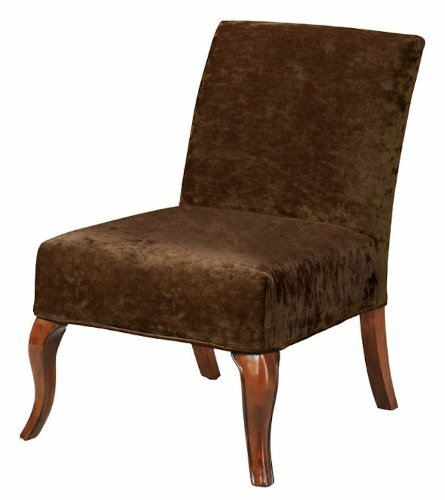 With slipcovers as an option your chairs will always change with your tastes and can help give a room an elegant accent. Traditional Parsons chairs have great features. Wooden legs in deep finishes like dark oak, walnut, mahogany and cherry in the shape of an "S" like curve (Queen Anne Style) are common and elegant. Another name for them is "Cabriole" legs. There is also a chippendale style that's pretty popular. The chair backing typically is scrolled into a crescent or camel hump shape. 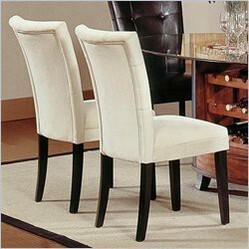 This gives them a touch of class and formality that adds more elegance to an already elegant overall chair style. One thing I like about a certain style of Parsons chair is the fully skirted versions add even more elegant flair to the brilliant look of the chair (see next big image). These can be straight, triple, or box pleated for a touch of class. Although the parsons chairs are designed for simple elegance, you actually have a vast number of options. You can choose the fabric type and texture. You do this not by some expensive "custom" job, but simply by adding accessories like parsons chair covers to the mix. 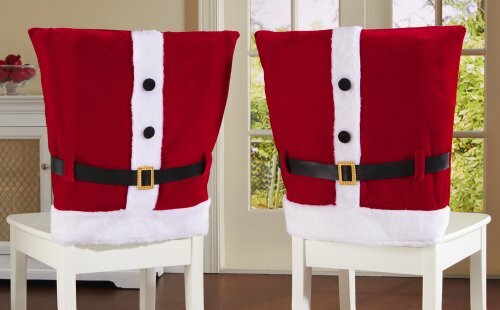 These fit over the chair like a glove and even hug it so tight you would think it was already there when you bought the chair! Attainable From Any Chair With SlipCovers! There are simple patterns to complex ones. 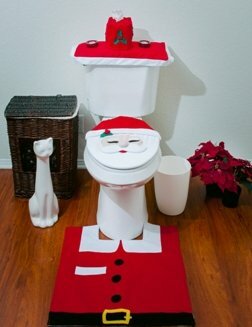 You can find them to match any decor but also have them custom made to match specific and unique decor too! One idea is to pair light fabrics, be them solid colored or patterned just subtly, with a darker wood. Light colors stand out against dark wood nicely and offer a contrast that's beautiful and simple, even elegant. Ivory and light schemes (blue, pinks, pastels etc...) make great choices too. Another great thing about parsons chairs is that even traditionally designed models can be converted to the latest color scheme, patterns, and heavier prints or richer colors. There are large floral prints, scrolled patterns that create complex and cool designs, burgundy / green colors, dark golds, blues, reds, and yellows! You can also choose "nailhead" trim, bands that are braided with hanging tassels and other classic concepts. Classic and new this chair is a time machine and chameleon! Classic accents on a modern style or print can be an amazing combination too! 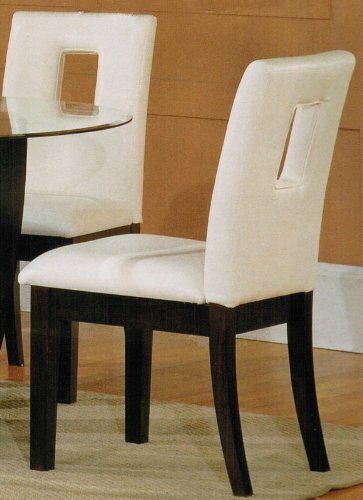 Recent chairs use an incurved side design that looks fantastic, elegant, and classic. Details ironically are this chairs best asset! The legs even have choices from straight edged or tapered and saber styles. You can get these legs in bare wood or upholstered as well! This adds a nice protective element (for your floors i.e. wood and even carpeting) to the chair. If you don't want to upholster the legs you also have an option of a skirt, plain or pleated for charming aesthetics. Some of the clues that we're living in a caffeinated society (coffee drinkers abound) is evident in the names of some of these delicious wood types for parsons chairs- Chocolate Espresso and Cappuccino! You will actually see these chairs AT Starbucks Bistros! Lighter wood choices are also available such as (still delicious sounding description words) Honey-toned-oak. Both of these go great with the most modern aesthetic of all- Leather. You can get leather in just about any color these days, but the white, rich browns, and black seem to hold up the best in various configurations (color schemes). Vinyl and microsuede are also available. People generally like these in solid colors because they can more easily blend them into their living room, dining room, or other areas. With today's slipcovers for parsons chairs you don't really need to worry about it. If you find a parsons chair at a garage sale and it's a bit beat up- a slip cover will make it brand new again! The patterns available today are staggering. What you want for this chair is elegance and simplicity. You want geometrically based patterns like the broad stripes and block designs. There is also a welt banding option around the perimeter of the chair that enhances the design lines of the rest of the chair. Traditional and contemporary styles blending seamlessly is known as "Transitional" style. It's due to it's extreme versatility and adaptability. Many also call this the "safe" way to decorate because these styles of parsons chairs, for example, tend to go with anything and tend to transcend the style and themes in the room it was bought for! This chair is versatile in that it can be put just about anywhere and fit in. If you need to change colors you can get a slipcover! Transitional parsons chairs should combine the rounded edges of the crown with the straight edged wood, upholstered, or skirted/pleated bottom. Keep it simple including the skirt. The best way to go there if you don't want a plain skirt, is to use a kick pleated skirt, these look great and can be attached or taken off if you use a slipcover to create the effect on a non skirted chair. That gives you more options. Traditionally, these use lighter wood tones and finishes like oak, maple, fruitwood, or variations of light toned wood. For a truly transitional (timeless) chair, you want to make sure you use basic colors, contemporary colors and designs with not a lot of detail. The more detail in the chair the harder it is to fit into certain themes. This, however, is remedied by slipcovers as well! Now if you want to add more "zest" to your chairs to make the room pop or to add some zing into an already popping room- the Tropical styles are great! This style puts more emphasis on using natural colors, materials, and blends that are extremely popular in the modern day marketplace. Tropical colors have always invoked inspiration, energy, and fun, but the right colors can also create a meditative and tranquil environment as well. You can blend different rooms with different color schemes. 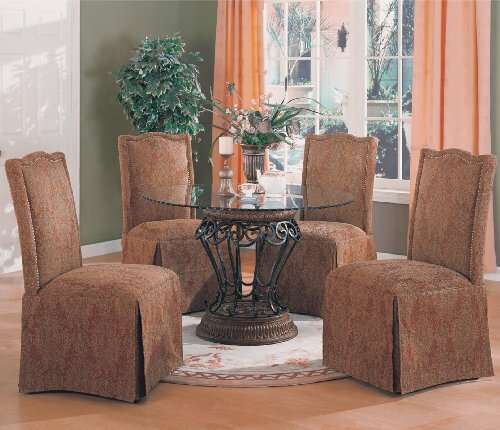 WIth slipcovers you can reuse the same chairs if you like- makes them more versatile! Tropical themes make one feel like they are at the beach or sitting in a great chair on the sand. You can actually envision this chair on a beach and looking great there! Using soothing shades like cream colors and pastels (light green, blue, pink, etc...) and lightly printed floral patterns also bring something to the table (pun intended). Some have designs like palm trees and even stars or moons for fun. The cottage style chairs are one of the most popular today (and yesterday!). It's no wonder people love it though as it's main selling point is it's focus on comfort and an antiquated aesthetic feel. They are called cottage style because they are generally put in "cottages" or small homes/flats and fit great into the scene. These chairs are not a catch all design. There are several features you can choose from and blend together to make it fit into any decor. Some chairs have accents that help it blend in. Slipcovers are also an accent that would apply and does amazing things for older chairs that may have scratches or unsightly tears- just cover it up! Ruffled/pleated skirts are great for this type of chair. If you don't want a skirt you can choose some cool leg styles to help it blend. 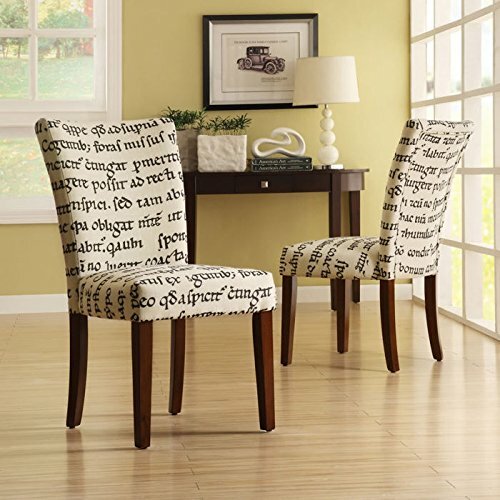 Casual Styled Chairs encompass country and cottage elements (described above). 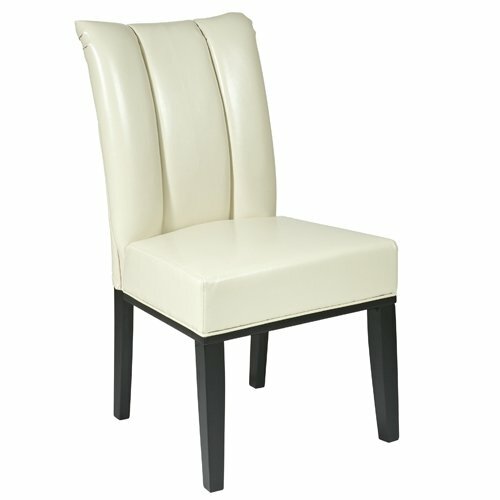 These come in straight or slightly tapered, upholstered and non upholstered leg styles. Stick with pine, white, and cream colors in this style for best aesthetics and style function. This style is about relaxation and passive energy. Using anything loud or robust in detail is more of a Tropical style. Parsons chairs are a no brainer. They're comfortable, elegant, and a fun addition to any home. These chairs are used in a variety of ways from patio furniture to dining room chairs for special occasions to everyday seating in the family room. You can move them from room to room, often without disturbing the balance of the themes in the other room! The original design was upholstered in leather. This is still very much used today but many other materials have been introduced successfully. 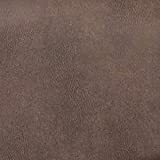 One of the most popular is the microfibers (including microvelvet). It adds another layer of class to the chairs already classy designs! It's popularity will endure I'm sure for centuries. You will see a lot of Parsons chair designs on futuristic shows because although it's design is from the past, it's aesthetics will endure well into the future. One place you will almost always see these chairs are in Restaurants and Hotel Lobbies. One reason these chairs tend to feel so "special" to many is this subconscious realization that they've seen them before somewhere they were having a good time! Many actually own these chairs but have no idea even what they are called. If you ran into this article in that search I hope this comprehensive review will answer all your questions! Thank you for reading! If you like to rock -- the old-fashioned way -- this article can help you find a wooden rocking chair you will love for less. Retro is very hot, and you can find lots of very interesting retro kitchen furniture, small appliances, and accessories for affordable prices.